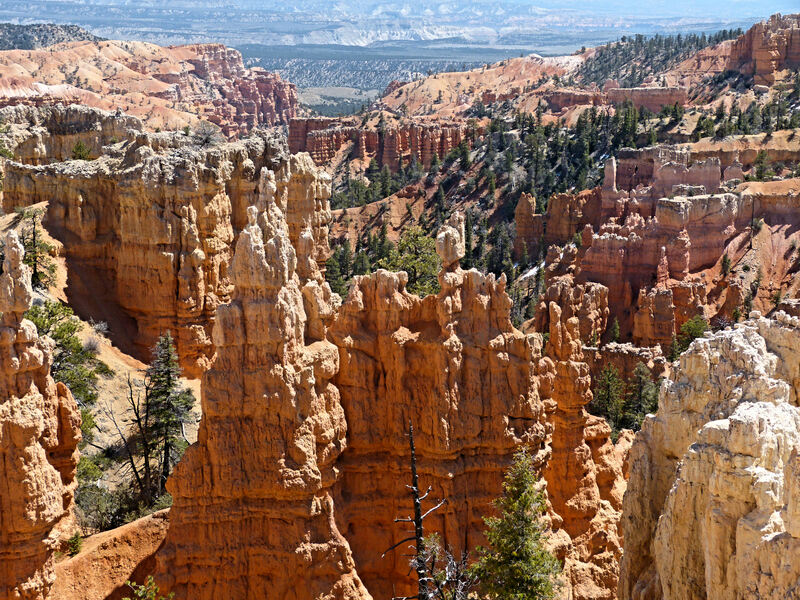 Bryce Canyon NP follows the plateau rim for approximately 18 miles of amazing views of the hoodoos, fragrant pine forests, and elevations ranging from 7,700 to over 9,000 feet above sea level. Because of the high elevation, the temperature tends toward the cool side, with freezing temps the norm each night. We visited Sunrise, Sunset, Inspiration and Bryce Point. Woolly Bear was allowed to hike above the rim between Sunrise and Sunset Points. 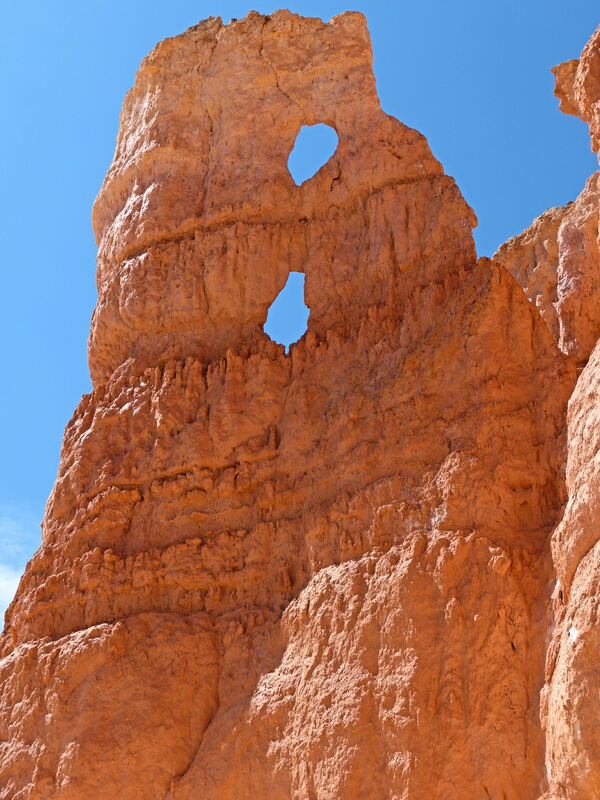 Then he stayed in the camper while Charlie and I hiked below the rim into the hoodoos of the Bryce Ampitheater. We took the Queen’s Garden Trail toward Thors Hammer. 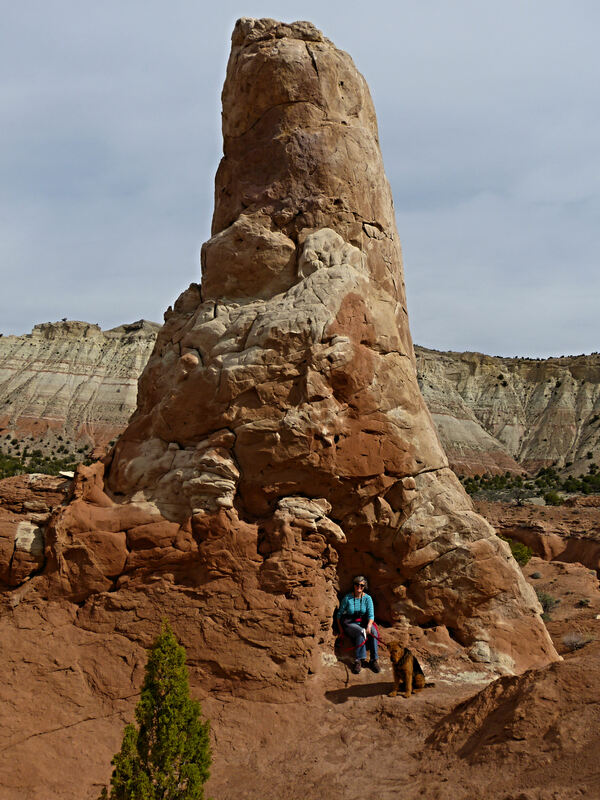 We also hiked some at Fairyland Point, which is a smaller amphitheater of hoodoos. There is still snow in many places, and we were pleased that the road to Rainbow Point was clear and open for us. We spent one day just driving through the park and stopping at each view point , including Farview Point, the Natural Bridge, and Agua Canyon. On our last day in Bryce we took a twenty mile road trip to Kodachrome State Park along scenic Rt 12. The Kodachrome Basin is a spectacular area of towering sandstone chimneys. There are 70 monolithic spires, ranging from 6 ft to 170 ft in height. The color and contrast prompted the National Geographic Society to name the park Kodachrome in 1949. And yes, Kodak Film Corp gave their blessing to the name! We loved the fact that Woolly Bear could hike anywhere in the state park, provided he was on a leash. But, we have to watch him with the strong sun and high elevation to make certain he is drinking enough and not over heating. We hiked to Angel’s Palace, which had magnificent views. Then put the WB in the camper before doing a bit more hiking. One can camp at Kodachrome, but reservations are a must this time of year. Every site was taken! We paid an $8 day use fee to hike at Kodachrome. It might have been the best $8 we have spent this trip! We wanted to add more pictures, but our campground wifi is not cooperating! Will add the Kodachrome pictures when we have better service. We are on the road today, headed for Utah’s remaining three national parks: Capital Reef, Canyonlands and Arches. Will post about them when we have internet! 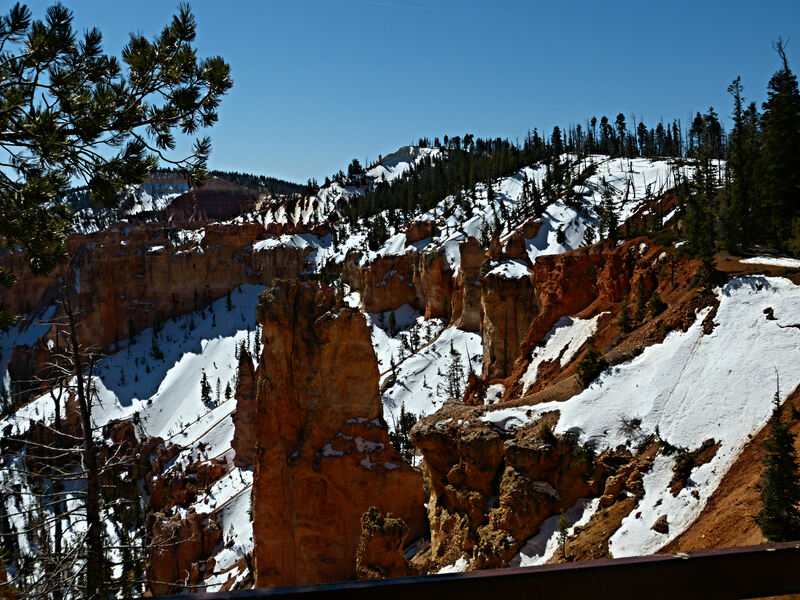 This entry was posted in Bryce Canyon NP, camping, National Parks, Utah on April 10, 2014 by Ramblin' Rose. Such an interesting area. As always, great pictures Charlie! Thanks, Wendy. I told Avery I miss our Saturday coffee breaks:) we will have a lot to catch up on when I get back. I think Bryce Canyon yielded the best pictures of my parents’ whole trip. Even better than Grand Canyon, I think! I also had trouble with the wifi at Bryce! I remember driving around in a thunderstorm trying to get closer to this building or that building, so I could check on my flight status and see how far we were from the airport (FAR. I flew out of Grand Junction CO). Hey there Avery! Great to hear from you:) I miss Saturday coffee with you and Wendy.